9:15-10:30 BLAST (music and classes), 2nd, 3rd, and 4th Sunday of the month. Childcare is provided from 8:30 am until noon on Sunday mornings by a staff caregiver and Safe Sanctuary trained volunteers. When parents sign their child into the nursery, they receive a beeper with a number corresponding to the number on their child's nametag. To ensure the safety of children, caregivers will verify the parent's pager number matches the number on the child's nametag before releasing the child. 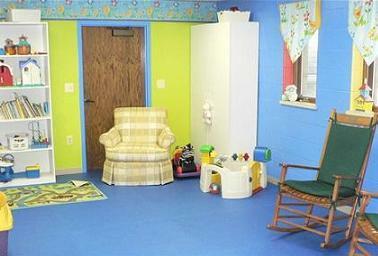 We ask that parents please label all bags, bottles, and other items they leave in the nursery with their child. Children begin the morning in worship with their parents at 9:00am. After the opening music and message, they are dismissed with their leaders to attend BLAST. Preschool BLAST includes Bible Stories, crafts, activities, and music designed to teach children: God made me, God loves me, and Jesus wants to be my friend. Children attending Preschool BLAST must have a nametag on before going to worship. Nametags can be found in the church lobby. Parents will need to show their portion of the nametag when picking their child up after worship. On the first Sunday of each month, Oct.-May children attend the 9:00 BLAST worship service with their parents instead of class. This service introduces the new BLAST virtue and provides a shared faith experience as the whole family worships, sings, receives Communion, and prays together. Parents of preschoolers can choose to have their children participate in this special service or go to the nursery. Worship is at 8:30 & 10:00, and the nursery is open from 8:15-11:15. 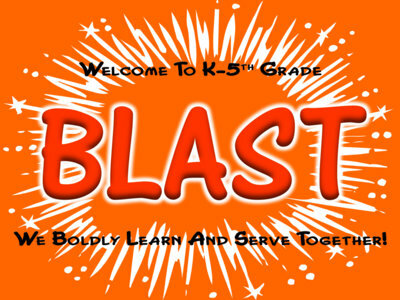 PreK-5th Graders are invited to BLAST following the Children's Message during the 10:00am worship service. We'll learn and practice , our monthly virtues through Bible Stories, activities and mission projects. The "S" in BLAST stands for "Serve." Join us this summer as we serve God by serving our neighbors. Summer BLAST is our replacement for VBS. Instead of offering 4 morning sessions of VBS and then "closing shop" for the rest of the summer - activities, lessons, mission projects and fun are planned all summer long. Come have a BLAST with us! Children, 4th grade and older, are invited to assist in worship as acolytes. Training is available each fall. Contact Liza Gray in the church office for more information HERE or (734) 475-8119. Or send a message to Michelle here.